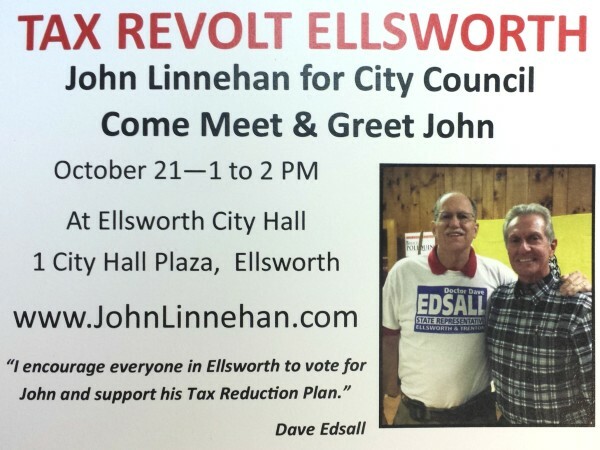 This mailer for Ellsworth City Council candidate John Linnehan, which includes a photo of Linnehan (right) standing next to House candidate David Edsall, has prompted a complaint to the state ethics commission from the Maine Democratic Party, which contends the flier and similar newspaper advertisements violate the Maine Clean Election Act. AUGUSTA, Maine — The Maine Ethics Commission has called a special meeting for Monday morning to determine whether a House candidate from Ellsworth’s appearance in another candidate’s election mailer constituted a campaign finance violation. The Maine Democratic Party has asked the commission to investigate David Edsall, a House candidate from Ellsworth whose picture appeared in two newspaper advertisements and a mailing paid for by John Linnehan, who is running for the Ellsworth City Council. In the photos, Edsall is wearing a T-shirt advertising his candidacy, and in the advertisements, Edsall endorses Linnehan. The Maine Democratic Party contends that Edsall’s involvement in Linnehan’s ads should be viewed as a contribution to Edsall, which is illegal under the Maine Clean Election Act. Edsall is challenging incumbent Democratic Rep. Louis Luchini for the House District 32 seat. At issue are advertisements that ran in the Ellsworth American on Oct. 20 and 27 and a campaign mailer that was sent on Oct. 18 to more than 4,100 addresses in Ellsworth. Timothy Bryant of Preti Flaherty, who is representing Edsall, denied the allegations. The special meeting begins at 9 a.m. Monday at the commission’s headquarters in Augusta.